It was beyond an honour to host the inaugural PFL Championship on New Years Eve! 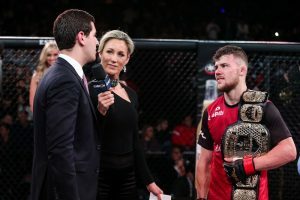 It was a dream of mine to step into the cage to conduct post fight interviews. To be the first person to talk to the champions, see that raw emotion and celebrations with their family after the years of blood, sweat and tears (literally) was very emotional. Thank you PFL & NBC Sports for the opportunity. 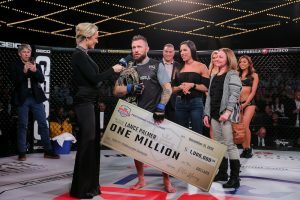 If you’ve not discovered this Mixed Martial Arts league then head over to the website to replay all the action www.pflmma.com and get set for Season 2 later this year. It’s MMA meets March Madness!! The first time an MMA organization has ran an individual athlete sports league. 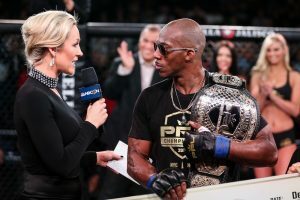 So much respect for all the fighters and huge congrats to our champions Louis Taylor (middleweight champ), Lance Palmer (featherweight champ) Natan Shulte (lightweight champ), Sean O’Connell (light heavyweight champ), Philipe Wins (heavyweight champ) and Magomed Magomedkerimov (welterweight champ) & special event winner Kayla Harrison. A cheque for $1,000,000 ain’t a bad way to start the new year! Ask yourself the question this year…what do you fight for?